Towards the beginning of the year, we learned that specialty film distributor Picturehouse was making a comeback with Metallica Through the Never, a new feature film getting an IMAX release. Now we have a first look at the hybrid concert film and narrative which features Chronicle star Dane DeHaan (who will also be seen in The Amazing Spider-Man 2), and it looks interesting to say the lest. The film is said to follow DeHaan as one of Metallica's crew members sent out on sort of mission during one of Metallica's sold out shows. And the story is supposed to take off from there and get crazy as only Metallica fans would expect. 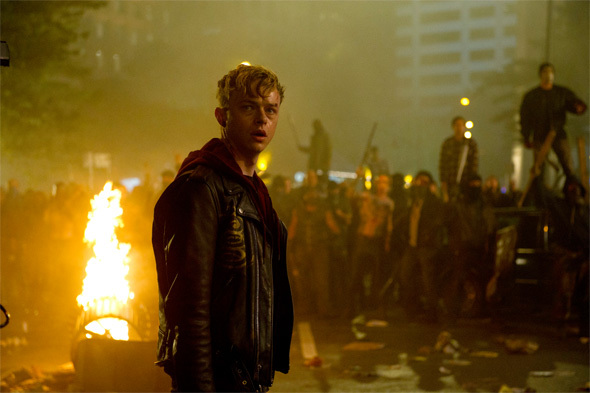 Starring Metallica, a cast of thousands of their fans and breakout star Dane DeHaan (Chronicle, The Amazing Spider-Man 2), Metallica Through the Never is written and directed by filmmaker Nimrod Antal (Predators, Kontroll). The film marries groundbreaking footage and editing techniques with a compelling narrative, in which a band crew member (DeHaan) is sent out on a mission during Metallica's roaring live set in front of a sold-out arena. While on this mission, he unexpectedly has his life turned upside down. The film opens exclusively in IMAX theaters September 27th and will hit additional theaters October 4th. Never heard about this. Sounds great. If they're featuring songs from throughout their catalogue, I hope to hear something from St. Anger. I know it's not well-liked, but maybe it could be used in a fitting way in the film. I am not the biggest Metallica fan so many of the references will be lost on me. A Metallica movie, I'm not their biggest fan but I'm still a fan so I find this cool! Sounds like Across the Universe, which was great, so this sounds promising. This sounds great! I'm sure the demographic is not as wide a base as most, but if you are a fan of Metallica or rock music in general I think it will be a good time.... I'm just freakin' excited that one of my favorite bands are getting a freakin' IMAX movie. I'm sure if you had one of your favorite musical acts get their own movie you could understand how cool this is! "WE'RE OFF TO NEVER NEVER LAND!" I'm gonna have to download this...oops sorry Lars.